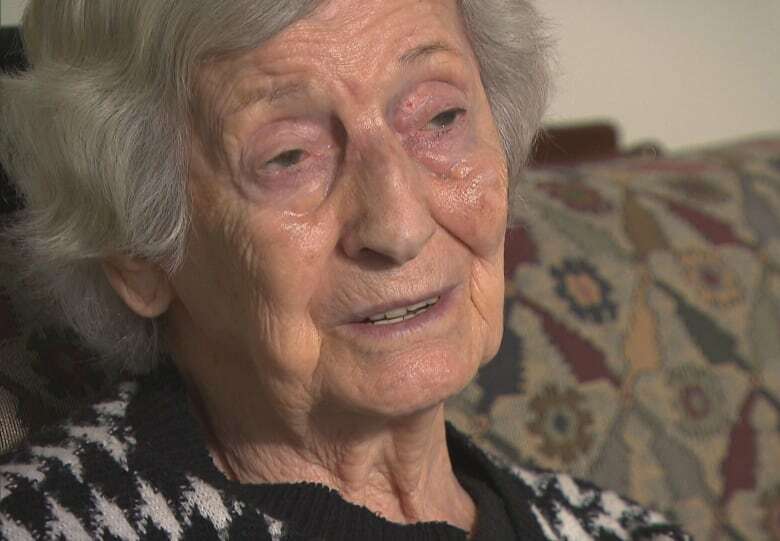 A 92-year-old woman was left bloodied and bruised after Montreal's public transit service for the elderly and disabled put her in a vehicle with a man she says the driver knew was dangerous. Hanka Fogelman was left bloodied and bruised after a public transportation service for the elderly and disabled put her in a vehicle with a stranger who turned violent — a man Fogelman says the cab driver knew could be dangerous. 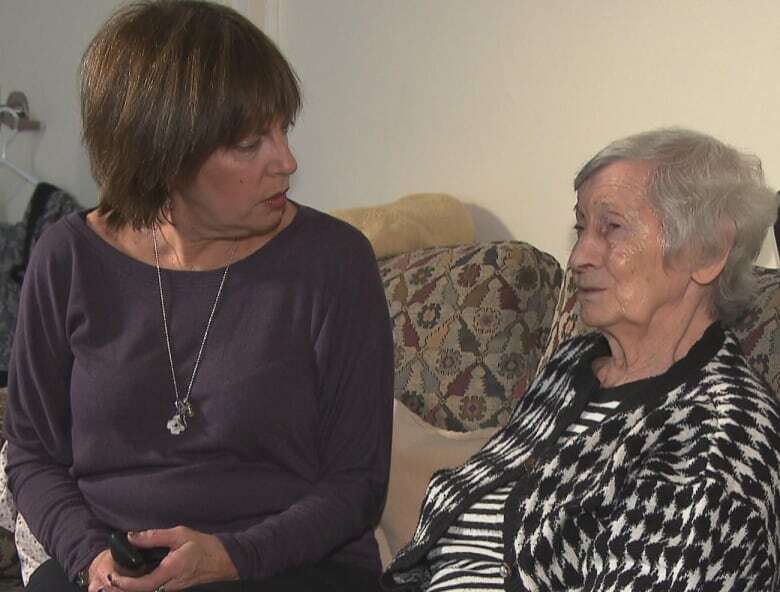 The 92-year-old Montreal woman, who is a Holocaust survivor, says as soon as she got into the back seat the driver warned her about the young man sitting next to her. "The driver knew that he was aggressive … said not to talk to him. [He said] he's aggressive. He's a little dangerous," Fogelman told Go Public. 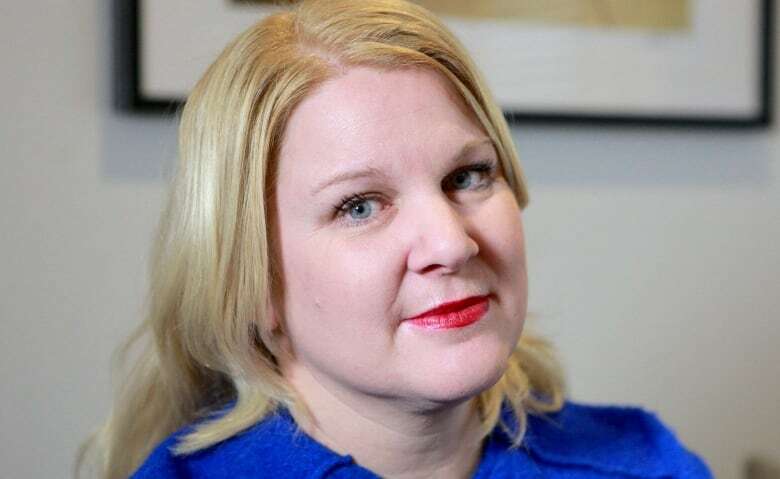 Laura Tamblyn Watts, an advocate for older Canadians, called the attack a "failure of the entire system," a system she says often puts costs ahead of safety when it comes to providing services for seniors and the disabled. When the attack happened on Nov. 11, Fogelman was riding in a cab contracted by Société de transport de Montréal (STM) on her way to visit one of her daughters. The Montreal transit-run service provides rides for people with physical and mental disabilities and mobility issues in private cabs and paratransit buses. According to a police report, when Fogelman was picked up at her home, a woman was in the front passenger seat and the man who later attacked Fogelman was in the back. The Quebec senior says minutes into the drive, the man got violent. "He started hitting me. Punching me," she recalled. "The blood started coming out from my nose. I didn't know what to do." In an internal STM report provided to Go Public by Fogelman's daughter, the driver writes, "the two hadn't even spoken to each other before this happened. The young man had been writing quietly on a piece of paper, when he suddenly hit the client seated to his right, without any apparent reason." Go Public was unable to reach the taxi driver for further comment. When officers arrived, they found the male passenger still sitting in the back of the cab doing a crossword puzzle, seemingly unaware of what he'd done. Montreal police spokesperson Insp. André Durocher told Go Public the man has an intellectual disability and won't be charged. Fogelman was taken to hospital by ambulance. "She had a broken nose. Lacerations on her face… Black and blue," said daughter Debbie Rona, who flew from British Columbia to be by her mother's side after the attack. "I feel angry. I feel shocked," Rona told Go Public. "I look at my mother and she's so mentally aware, but there's physical vulnerability there. Why was he even in the taxi? Why would the taxi driver have sat my mother next to him and closed the door and started driving?" Go Public spoke with another cab driver for STM who said violent incidents are rare, but believes the transit company needs to do a better job of preparing drivers for when they do happen. Driver training doesn't include how to deal with violent or aggressive passengers. The man asked not to be identified, concerned he could lose his job for speaking out. "According to the STM, they are not transporting people who are violent — is it 100 per cent true? Definitely not," the driver said. STM spokesperson Philippe Déry said in an email to Go Public, "we can assure you that at the time of the incident, nothing led us to believe that the customer was in danger by being paired with the other customer." Déry said the service pairs customers according to the space available and where they are travelling. Go Public asked why a 92-year-old woman would be put into the same vehicle as someone the driver felt he had to issue a warning about. "The driver simply wanted to ensure a smooth trip," Déry wrote in response. "Some customers may be tempted to socialize with others who may exhibit disorganized behaviour in certain situations. Most of our drivers frequently do this simply as a preventative measure." STM wasn't able to tell Go Public how many violent incidents have been reported, saying it doesn't track them, but Déry says they are "very rare." In an unusual coincidence, Fogelman's husband, Léon Besnos, died not long after being beaten by a stranger in 1986. 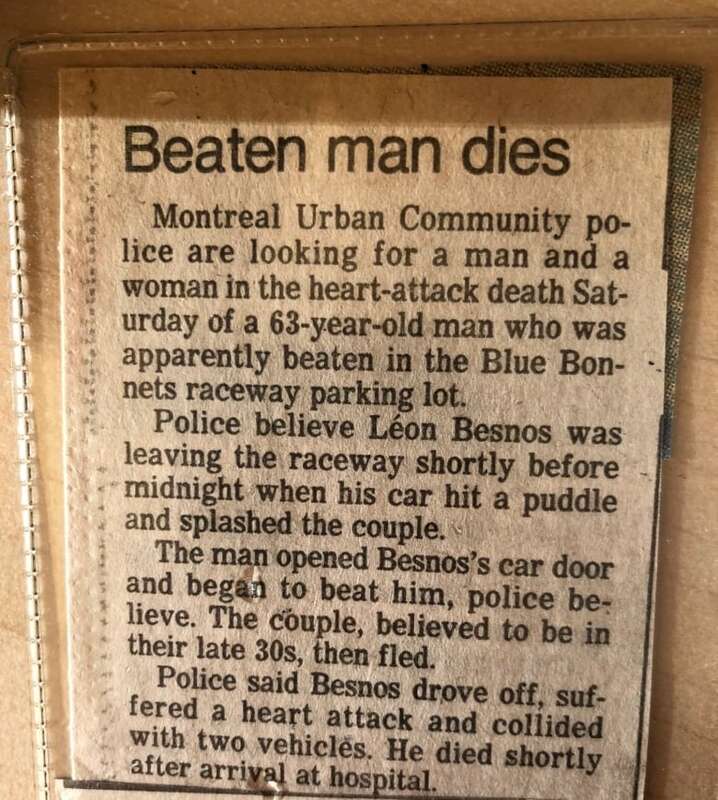 According to news reports at the time, Besnos was beaten by a stranger after his car hit a puddle and splashed a couple. The man opened Besnos's car door and began to beat him. When Besnos drove off, he suffered a heart attack and collided with two vehicles. The 63-year-old died shortly after arriving at hospital. "After what happened to my dad, I became sick…. When I found out about my mother ... I feel vulnerable," Rona said. Passengers' vulnerabilities should be part of the planning process for public transportation services, said Watts, chief public policy officer for CARP, an organization that advocates for older Canadians. 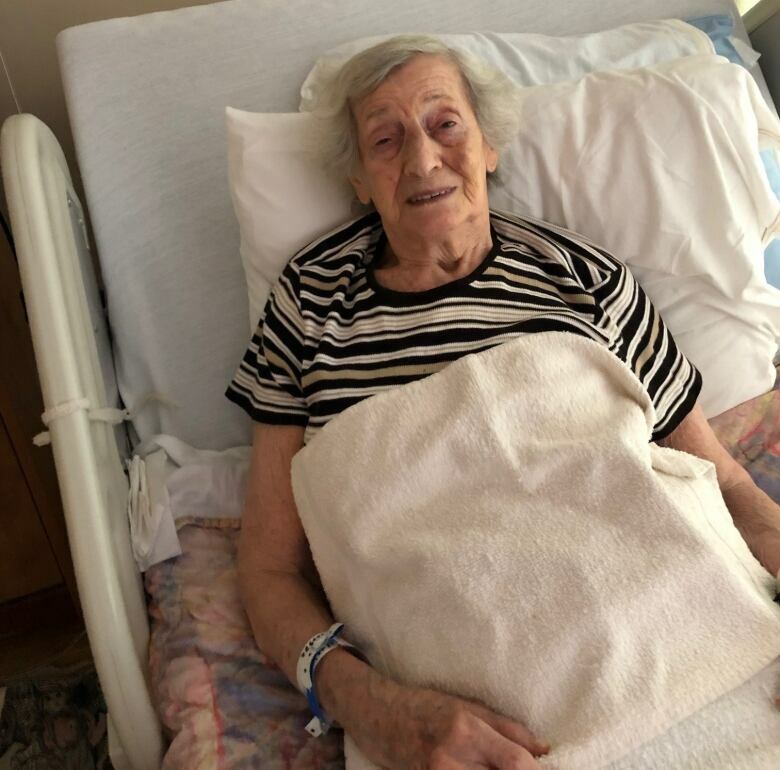 She said a frail 92-year-old should never have been put in a vehicle with someone who posed even a possible risk, calling the attack on Fogelman "unacceptable." "I was saddened, but I wasn't especially shocked," she said. She says these kinds of transportation services, which exist in all major cities, often make decisions based on cost — how many people fit into a vehicle or where they're going — instead of planning rides according to a passengers' needs or vulnerabilities. "It's not about dollars. It's about making sure that people get the care they need and that they're safe while doing it. Drivers and passengers alike." Watts believes the transportation service in Fogelman's case also failed the driver who had to deal with the attack, as well as the man with the developmental disability by putting him in a situation where he could harm others. Go Public contacted public transit services in several other municipalities, asking about policies regarding potentially aggressive passengers. Some jurisdictions, including Montreal and Vancouver, require a form be completed by a health-care or educational professional, outlining the nature of a person's disability. Other jurisdictions — such as Winnipeg — go further, requiring most applicants to undergo an in-person assessment before being accepted into a program. STM told Go Public that during the admission process, it sometimes contacts a health-care professional to see if behavioural problems could be an issue with certain customers. Fogelman spent a month in a rehabilitation centre after being beaten. It's now two months after the attack and she says she's still not healing. "I'm still not feeling strong … it's in my mind. You know, what I went through … I'm thinking, why did it happen? You know. It shouldn't have happened."